Which Tarot court card hand-rears baby birds? No, it’s not a trick question, but a genuine one because as of yesterday afternoon, I am guardian to a baby crow which is FAIRLY close to ‘black bin bag’ territory, if you catch my drift….. I was weeding in the greenhouse (in a foul mood actually because 24 hours earlier I’d planted a rather ‘spensive clematis in the front garden and discovered today that Tartarus has joyfully weed-killered it). Reader, I was attacking those tiny green unwanted SOBs with GUSTO (imagining each one of them to be a tiny husband). A shadow fell across the doorway: Tartarus. ‘I suppose you’ll be wanting to try to save this one too then?’ I turned round expecting to see another weed-killered plant, but instead it was…. Well, I say ‘chick’ but it was quite well-on; it had all its feathers, but he just didn’t have any energy to fly in this really hot weather. His eyes didn’t look too bright and it’s never good when you can actually manage to pick them up. Tartarus tipped chickie (let’s call him Noir because he’s black) in to the box and he just sort of sat there. Well, nothing ventured nothing gained, isn’t that what they say? So I got my tiny dropper (available from any chemist) and a little glass of water and between us, Tartarus and I managed to give Noir a couple of droppers of water. We shut up the box and went off to, well, basically be in The Huff with each other about the callous clematis murder in the front garden for a few more hours. About an hour later I thought I’d better have a look in on the bird and was heartened to see that he was much more active. And he’d done a poop – always good news. Time to try a little mashed dog food. Nero (our greyhound) looked very interested indeed as I opened some Pedigree Chum and spooned some into an egg cup and frantically mashed it to bits with the back of a spoon. Tartarus got his gloves on again and I set-to with the dog food and tweezers. Noir was very active indeed and we considered letting him go at this point. He hopped out of the box and teetered unsteadily on the edge of it, his eyes were now nice and bright…..and – would you bloody believe it – the damned dog made a lunge for him! Cue much screaming and shouting at the dog as we scooped up the bird and popped him back into the safety of his box. Well, if he survives until tomorrow he will have survived more than any of the other birds that I have tried to rescue. So, which court card am I? Unfortunately, I think I’m a bit Knight of Wands about all this – rushing around, trying to rescue a bird that has probably been abandoned because its not viable. The Knight is definitely someone who TRIES to effect a rescue. Is he successful? Perhaps not. 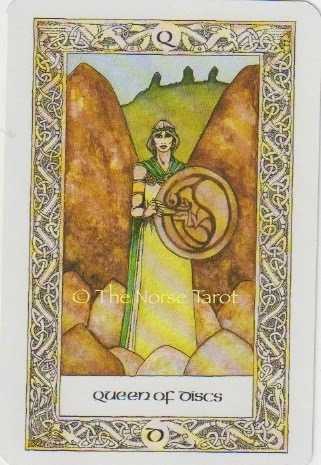 The Knight doesn’t have a lot of ‘stick-to-it-ness’ as fellow Tarot blogger Chloe so wonderfully pointed out. Like the Knight, I have NO plan at all for this bird, other than getting it to live until tomorrow. What if Noir survives? I haven’t thought that far ahead – I’m offsky at the weekend to a gig on the mainland – what then?! Should I look for 23 blackbirds and a packet of pastry?! What I really NEED to be is the Queen of Pentacles and patiently nurture and care for this little soul in dire straits. I need to take things more slowly, be more deliberate, find out what care he really needs and be prepared to do what it takes. Even if that means mashing up worms. Or consigning him to the Black Bin bag. And the Queen of Pentacles will do well to remember that we can’t all be James Herriot. **NB** I wrote this post a couple of nights ago and I’m delighted to say that I released him back into the wild, well, the garden at any rate, this morning. I spotted him this afternoon, up a tree, so providing he can pick up some grubs and stuff, he can keep himself out of harms way. I’m calling this a ‘successful outcome’. Until I find his desiccated body in the undergrowth in a few months. Update 25/6/14 – He returned to the garden twice since I wrote this post. He had a few chunks of dog food and then proceeded to enthral me with some wobbly flights. Yesterday, 24th June, he flew out of the garden over the gate, lovely and straight, away over all the back gardens – he can feed himself and he can fly. Job done. Seems like you have more of the Queen of Pentacles to you than you give yourself credit for 🙂 Glad to hear little Noir is doing well! Well done, Ali! Especially for a Wandsy person. Instincts and impulse paid off this time. Last time we boxed a baby bird, it did not do well. Like you say, oft times there are reasons that they are abandoned. Although nowadays, baby birds are quite rare because our garden is on a cat highway in the neighborhood….